After finally getting a book published, many authors findthat the hardest part wasn’t actually writing the book or getting it into print. The biggest challenge lies in marketing the book. Aside from the fact that it can be overwhelming, most authors have day jobs and not much time to figure out which book promotion strategies will work. The Nonfiction Book Marketing Plan is loaded with proven and effective tactics to make the marketing journey a bit easier and a lot more effective. Each chapter concludes with an interview with a successful nonfiction author, providing even more real-world insight. Written for new and established authors of business, self-help, health and wellness, memoir, how-to, and other nonfiction books, The Nonfiction Book Marketing Plan will help you identify proven tactics that you can begin implementing immediately to reach your audience and sell more books. Stephanie Chandler is the author of several books including The Nonfiction Book Marketing Plan: Online and Offline Promotion Strategies to Build Your Audience and Sell More Books and Own Your Niche: Hype-Free Internet Marketing Tactics to Establish Authority in Your Field and Promote Your Service-Based Business. Stephanie is also founder and CEO of the Nonfiction Authors Association, a vibrant marketing community for trail-blazing writers, and the Nonfiction Writers Conference, an annual event conducted entirely online. A frequent speaker at business events and on the radio, she has been featured in Entrepreneur, BusinessWeek, and Wired magazine. See also: @bizauthor and @NonfictionAssoc on Twitter and Facebook.com/NonfictionAuthorsAssociation. “Nobody knows internet marketing for authors like Stephanie Chandler! an invaluable resource. Highly recommended." of the amazing opportunities for sharing your passion for your work." 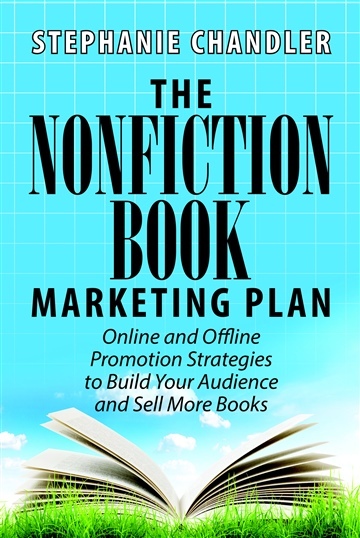 Nonfiction Book Marketing Plan, is a bible for the nonfiction author . . .